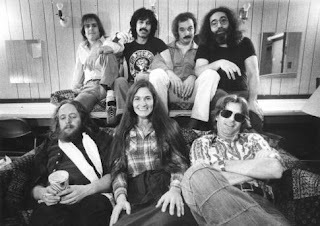 Greetings fellow sonic travelers, welcome to part II of my in depth review of the Grateful Dead's 14 CD May 1977 box. Part I can be found here. In this edition we will pick up with the May 15, 1977 St. Louis performance in full swing and conclude with the box set's final performance from Tuscaloosa, Al on 5-17-1977. Don't forget to search out the shows that follow these performances, as they continue the trend of towering legendary concerts. 5-18 has another stellar 'Other One', as well as a nicely developed 'Eyes'. After the 18th, five of the next six shows (except 5-26) can be found on official releases for your review! Enjoy the wealth of material available from this unparallelled run! Following 2 days off for travel and rest after the Chicago shows, the caravan pulls into St. Louis to continue the monstrous stomp through the month of May. The 15th opens with a blood pumping 'Bertha->Good Lovin' that gets fingers warmed up and the crowd primed. The band samples the diverse pallet that has been set up for the opening sets during this tour, including big solid versions of 'Row Jimmy' and 'Minglewood' that set the stage for the beautifully played sequence that leads to the definitive set closing 'Dancin'. Another levitating 'Lazy Lightning/Supplication' pairing leads to the second version of 'Jack A Roe', and then on to the first of two premiers on the evening. 'Passenger' roars from its freshly painted gates with steamy Garcia slide work and finds the guitarists in Lesh's words, playing with a bit more 'raunch'. A fine premier and a welcome addition to the Dead's repertoire. While the entire set is well played it is the concluding and stand alone 'Dancin In the Streets' that really takes the performance to the next level. Surpassing 18 minutes this version contains quality as well as quantity. From the outset its obvious that this one is going to be special, with Lesh especially playful, and some excitable drums. Jerry wastes no time as the lyrics are disposed of laying down a series of charged mirror ball runs up and down the fretboard. Staying close to the theme, at around six minutes Garcia descends for some funked up low register notes on his guitar that encourages the band into a smooth peak. Garcia then outruns the group as he solos aggressively and beautifully, channeling some unknown force. At a bit past seven minutes the band spirals down the wormhole and appears out the other side with Weir taking the wheel with a series of shaky chords and distinct hammer-ons. As we approach nine minutes there is a fresh and delicious run of improvisation that initiates another Garcia run of gold, that culminates in some climatic Garcia strums that again take the jam to another level. This segment illustrates an endless run of Garcia melodic ideas while the rhythm section stays surprisingly 'in the pocket'. The band soon reaches their glittery destination into the descending, stop-start landing point of the expansive jam. Following their return to the song proper, the drummers keep everything moving as Garcia, Weir, and Donna embark on an extended exciting vocal free form. Filled with Weir asides, Jerry interjections, and Donna cooing, this set closer finds the band excited and in peak form. Bobby introduces the set break but is drowned out by the still grooving band, so he attempts again after the song reaches a rattling conclusion. Wow. Even if 'disco' 'Dancin's aren't your thing, this one will do ya right. The second set begins with 'Estimated Prophet' a representation of its growing status in the set frame work. This is also the first time that the song would be joined with 'Eyes of the World' which would become a common second set occurrence appearing over 180 times over the next 18 years. 'Estimated' stretches its legs nicely, never straying to far from the theme until at ten minutes Garcia starts some scatter shot riffing trying to roll it into one. The appearance of 'Eyes',while not as long as the one on the 18th, has a different and unique energy. The two solo segments are joyous and tight with the band obviously locked in tight. At twelve minutes as the outro jam blossoms Garcia climbs the latter with Lesh as the drummers mirror his every move. This sweet movement develops into a sparkling exhale that gently blows into drums. The drums segment is a low key affair, but contains numerous moments of clairvoyance. Leading out of drums is a 'Samson' that screams, its hard to pick a version that tops them all because the song was played almost every night, but this one has to be in the running. A cool moment is a off mic Garcia holler, following the 'paws' line. Pausing briefly after 'Samson', Weir announces the celebration of Mickey Hart's birthday to the assembled crowd, who cheer excitedly. (Mickey's Birthday is is September) After some goofing the band begins an uptempo and welcome 'St. Stephen' that navigates its multiple changes crisply. Unfortunately after the 'Lady Fingers' verse the band screws up the jam sequence and instead slips directly into the 'Not Fade Away' groove. The band makes up for the slight mess up by riffing on and entering the first version of 'Iko Iko' ever played. Lesh slides low on the neck for a series of guttural bass statements that keep the rhythm popping. After two minutes of riffing Garcia sings one verse of 'Iko Iko' and then seamlessly slides into the matching 'Not Fade Away' pulse. At a bit after two minutes Garcia uses his 'Turtle Tone' and starts to ride the cresting wave set up by his band mates. Lesh follows Garcia's lead throughout the jam echoing, repeating, and accentuating all of his statements. The 'NFA' chewing gum groove stretches in multiple directions and sticks to some as the tempo increases and Hart punctuates with well times cowbell hits. Much of the improvised magic of 1977 can be found by cracking open the many versions of 'Not Fade Away', eventually culminating in gigantic fire breathing versions on September 3 and October 11th, 1977 respectively. At seven minutes Garcia starts to explore with an over driven tone, whipping the band into another direction that starts to swirl, like water rushing down the drain. At almost nine minutes the band meets in the middle and slowly melts into a rainbow of sound, Godchaux spreading a layer of piano trills over the shifting landscape, Garcia flashing like evening stars over the horizon, as Weir slips in the introduction to 'Sugar Magnolia' like a letter under a door. 'Sugar Magnolia' is a solid rocking version with all hands on deck, and closes the show in proper fashion. Garcia solos the crowd into a tizzy, and scrubs the band into a dizzying peak approaching the 'Sunshine Daydream' reprise. While not as much 'jamming' is contained within this the confines of this performance as the 13th and 17th, there are many hidden moments that deserve time and inspection. The 'Dancin' is an obvious peak that must be explored and revisited. Following the 'Sugar Magnolia' the group then returns for a laid back and meaningful encore of 'Uncle John's Band' that feels 'just exactly perfect'. The final show included in the box and this review could be the best of all, but that's why we listen and debate! With a day off after the St Louis concert the band got 'on the road again' to Tuscaloosa to share the gargantuan musical display that follows. The first set features many 'big' songs, and right from the get go the band is fired up and ready to blow away the assembled crowd. Opening with the first 'Minglewood' since Cornell the band fires the first shot with a peculating version full of hot band interplay. 'Half Step' follows is typical 1977 fashion and overflows with expression, featuring Garcia and Lesh trading rolls of melody encapsulated in the crystalline runs up their fretboards. There are some beautiful start/stops as well as perfectly placed caesura's. At a bit past six minutes there are some glistening tradeoffs between Garcia and Godchaux that are shiver inducing. The exit jamming soars, building one of the best 'Half Steps' of the month with Godchaux playing especially well. Garcia scrubs the band into a slightly awkward landing that eventually slips into 'El Paso'. Following a syrupy slow 'TLEO', a huge 'Jack Straw' cruises with the windows down to tempo setting fanning by Jerry Garcia that encourages the band to develop and display another definitive version. Next up comes the third 'Jack A Roe' on the box, and also the one featured on the release 'Fallout From the Phil Zone' and is the tightest and most expressive, but in my opinion they all spotlight something special. After slowing the tempo down with an atmospheric 'Looks Like Rain', the next 'big' song to appear in this long first set is a tender 'High Time'. 'High Time' was only played three times in 1977 (17, 18, 26) and all of those versions are from May, it would not reappear again until February of 1979. This is a transparent and fragile version that equals or surpasses the strength of all of the Garcia ballads plated during this month. Shivering guitar by Garcia elicits as much emotion as his still young and vibrant 'storyteller' vocals. The band then gets the crowd cooking with a sizzling 'Big River', brings them back to earth with a Donna spotlight version of 'Sunrise', and then blows them away with another expansive and set closing 'Scarlet/Fire'. The longest version of the tour thus far surpassing twenty six minutes, this pairing is a twisty and turning version that has a well thought out grey area that becomes a seamless segue. During the song portion Garcia takes more than a couple laps around the melody line, soloing up to the summit, gaining expansive views all around. 'Scarlet's' jam starts out with some exploratory soloing by Garcia and some smeared Lesh bass excursions. After some pensive probing things start to pick up. At around nine minutes Garcia starts to pick the band into circles, momentum is surely being gained, and like popcorn jumping in a pan Garcia starts to hit bouncing low notes that encourage the drummers to pick up the tempo and push the jam forward. You can feel the music start to breath and take on a tangible form. The music is playing the band, as musical statements are being tossed back and forth between the principles endlessly. Garcia then hits slapped wah-wah hints of 'Fire' as Weir tweaks tiny filigrees that twist the tempo, eventually Lesh hits the recognizable bass figure under this combination of colorful musical expression, sliding the band into 'Fire'. Maybe as good as Cornell? It doesn't really matter as this is a well constructed version that stands with all of the best from the tour. 'Fire' is a long version with important and relevant melodic statements occurring often, very unlike later years where in my opinion 'Fire' could become slightly redundant, a song for practicing stock riffs. Punctuated with chunky Garcia guitar during the introduction, this 'Fire' is worth your time, and an explosive prelude to the jamming to occur during set two. Set two screams out of the gates with the trifecta of 'Samson/Bertha/Good Lovin' that only lets up to settle into the ultra groovy tempo of 'Bertha'. The entire fire breathing beast awakes for a sample of this danceable and delectable electric dessert. The charge in the air is tangible on the soundboard recording, again Betty Cantor's recording techniques have blessed us with a flawless document over thirty years later. After stirring the crowd into a rock and roll tizzy, the band prepares for the evenings musical journey, unsure where it will lead. The nightly version of 'Estimated' comes first and is expanding slightly with each and every performance. Still not straying from the theme quite yet, by fall the song will be traveling into different realms and locations, and become a key instrument for the band's improvisation. Next up 'Terrapin' signals that the train is leaving the station and that 'the whistle is screaming'. 'Terrapin' trickles in on fat Lesh chords and delicate strums. This version again, like many played during this tour is almost note perfect, with expressive vocals from Garcia, attentive drumming, and amazing coloring between the lines by Godchaux and Weir. 'Terrapin' is the song that signals the new direction of the Grateful Dead, 'Terrapin' is the gate that swings open to reveal the secrets that band will reveal on this evenings excursion. After the perfectly orchestrated and climatic ending opus, the band falls into the introduction of the upcoming circular 'Playin In the Band' development. Similar to other versions of the month, once the band disposes of the lyrics the jam begins with pensive and searching Lesh notes. A major contrast to pre-retirement versions, the band quietly and sneakily feels around in the dark for anything they may recognize. Stick hits, cowbell strikes and other percussive accents start to snap, crackle and pop as the exploration away from recognizable ground starts to happen at five minutes. The musical amoeba starts to lose gravity and I catch a glimpse of Godchaux peeking around a darkened corner, playing hide and go seek with his piano. Garcia is using his 'underwater' tone and the music is dripping with psychedelic juices. In between six and seven minutes the jam comes to a Lesh created plateau that collects itself like water pooling after a heavy rain, and the disperses in multiple directions, running down walls and walkways, scurrying across windows. The music becomes a water soaked sponge, developing into a squishy melt, that leads to and then enters another portal and level of instrumentation. Having left the 'Playin' theme behind the tempo begins to rise and like a predatory bird making a swirl to the earth after nine minutes. 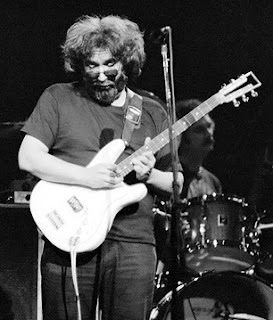 Jerry deconstructs the jam, Lesh rumbles underneath and chasing each others tails, they float into a shifty interlude that is one of the most involved and unique on the collection. Garcia moans spectral whispers from his Travis Bean guitar that are visual as well as aural. They have found the special location, the place where time stands still, and music leads the way. This unique moment runs into a drums that is very tribal and very attentive to its surroundings. The drummers actually create a rumbling and quaking segue into 'Wharf Rat' that Garcia uses as his entrance to the tune. This wondrous and seamless entrance to the song is unique and a wonder to behold. 'Wharf Rat' becomes a gently orchestrated version with crisply executed vocals and tasteful additions by the group. Garcia sings a mournful yet enthusiastic series of melodic expressions from his guitar during the first solo break. During his second solo spot at around half past nine minutes Garcia sounds his extraterrestrial horn into a more developed solo that is shortened because of its seamless decent back into the purple and dark blue 'Playin' theme. The return to 'Playin' gets 'ethnic' with some 'pot and pan' sounding drums. While the 'Wharf Rat' outro jam is shortened, we get a well developed and well thought out return to 'Playing' through a slightly funky and multidimensional excursion that pushes and pulls in multiple directions while always returning to some hanging thread. Garcia starts to reveal flashes of 'Playin' through the chimes and wash of cymbals as the dynamics get very quiet. I can tell you that I have discovered through my journey of May 1977, that there is gold to be mined from these spacy returns to 'Playin' throughout the month. Similar to post verse 'Other One' and 'Dark Star' explorations, these free form developments hold many magical and melodically unique moments. The band grabs hold and gallops into a full blast 'Playin' reprise that brings the journey to a proper conclusion. Garcia chicken picks and twangs his way to an explosive ending with the drummers punctuating his every move. Weir makes the comment after 'Playin' that 'We didn't think you lit hardly enough matches, but we are gonna do an encore anyway'. Weir also continues the Mickey Hart birthday jokes with the crowd to great amusement. The band follows this up with a heavy duty 'Sugar Magnolia' that lumbers with big feet, and continues to pick up energy, finally exploding into a glorious warm and breezy 'Sunshine Daydream'. Rock and Roll chops are on full display for this huge version! After this incendiary conclusion Lesh steps to the mic to say "Thank You' and let the crowd know they will be back in the future. A fitting conclusion to the show, and to the May 1977 box set. Like I previously stated, it does not end here, there are many more performances from this pinnacle year to dive into. The warm recordings, the camaraderie of the band, the instruments, the crowds, the new songs, the drugs, all combine to make this era in Grateful Dead history a special one. We are fortunate to have the documentation of these performances to keep enjoying and to keep turning new fans on to! Everyone has an opinion on the Grateful Dead, on what is the best show, what is the best era, instruments, keyboard player, etc, etc. But one thing is for certain, there can be no debate that during the Spring 1977 tour the band was hitting the note almost nightly. The performances remain fresh, well played, and still can induce chills and take you places if you let them. Thank you for joining me on my journey through these few shows from this definitive year in Grateful Dead history. I hope these reviews have inspired you to check out and/or revisit the era when anything was possible when the Grateful Dead took the stage.